This is such a skimpy post but I randomly threw together this "recipe" (in quotes because I use the word recipe lightly) last night and it was so delish! Nice and light on a screaming hot summer's night. * Put yogurt (any flavor- I used coconut but plain or a fruit flavor or vanilla would all be delish), orange juice and salt in a mason jar. Twist on lid. Shake shake shake. * Pour over salad and enjoy! 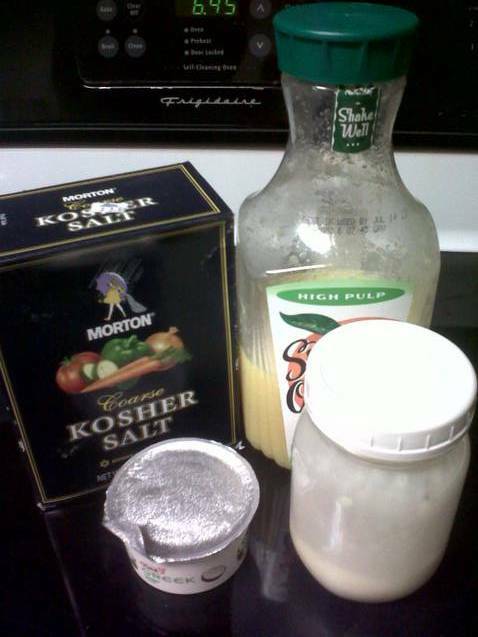 * You can adjust the thickness of the dressing by playing with the amount of juice you add. 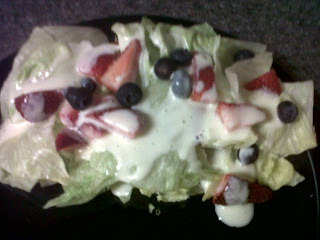 If you use fat free yogurt...well duh...the dressing will be fat free too. Ooh, that's wonderfully simple and sounds like it'd be perfect for the summer. Thanks for sharing! It's Hopsy's Last Bloggy Day! What's For Dinner? Sausage And Peppers. Does Anyone Else Watch Bethenny?